Civitavecchia passenger and car ferry ticket prices, timetables, ticket reservations and information for ferries sailing from Civitavecchia to Arbatax, Barcellona, Cagliari, Catania, Malta, Olbia, Palermo, Porto Torres, Trapani and Tunis. Compare all available Civitavecchia ferry ticket prices in real time and book the cheapest available Civitavecchia car and passenger ferry tickets sailing to and from Civitavecchia, Arbatax, Barcellona, Cagliari, Catania, Malta, Olbia, Palermo, Porto Torres, Trapani and Tunis with Tirrenia Ferries, Grimaldi Lines, Grandi Navi, Moby Lines or SNAV Ferries ferries online with instant confirmation. Book Civitavecchia Ferry Tickets with Tirrenia Ferries, Grimaldi Lines, Grandi Navi, Moby Lines or SNAV Ferries for ferries sailing from Civitavecchia to Arbatax, Barcellona, Cagliari, Catania, Malta, Olbia, Palermo, Porto Torres, Trapani and Tunis online in advance to enjoy the cheapest available ferry ticket price. The price you see is the price you pay. There are no hidden extras or surprises such as added fuel surcharges or booking fees and we do not charge you anything extra for paying with a Visa Electron card. The price we quote you for your selected Civitavecchia passenger or car ferry ticket, onboard accommodation and vehicle type is all you will pay, and that's a promise. To obtain a Civitavecchia ferry ticket price and book your ferry ticket securely online please use the real time ferry booking form on the left. You are also able to add a hotel at your destination, or anywhere else, to your ferry ticket when completing your ferry ticket reservation. Civitavecchia is a port located in the region of Lazio, used by cruise ships when stopping in Rome. The port is located on the Tyrrhenian Sea and is 80 km from the city of Rome, across the River of Mignone. The harbor of Civitavecchia, "ancient town" in Italian, is formed by two moles along with a breakwater, on which a lighthouse has been built. There’s no compelling reason to come to Civitavecchia other than to take a ferry to Sardinia. It’s not an unpleasant place, there’s simply not much to do. The port is about a 400m walk from the train station. As you leave the station, turn right into Viale Garibaldi and follow the road along the seafront. Near the Michelangelo fortress at the western end of the seafront there’s a helpful tourist information point. Civitavecchia is the ferry port of Rome with daily ferries departure to Sardinia Olbia and Porto Torres, Barcelona, Palermo, Toulon, Tunis and Porto Vecchio. 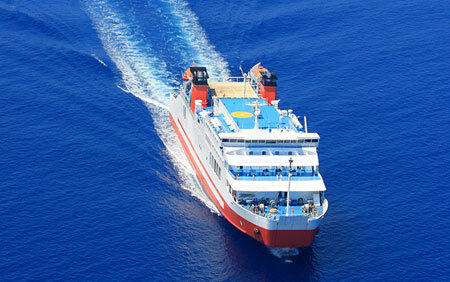 The port also affords docking facilities to large cruise ships traversing the Mediterranean. Cruise Passengers have use of a free shuttle to the port entrance, within easy walking distance of stores and a train station for economical travel to Rome. The large fort of Michelangelo is the most visited place in Civitavecchia. The fort was first commissioned by Pope Julius II in order to defend Rome's port. The construction of the fort was completed under the supervision of Antonio da Sangallo, Paul III, and Giuliano Leno. The maschio tower is the most noteworthy feature of the fort, the upper part having been designed by Michelangelo himself. There are four towers in the complex and the main tower of the fort is in an octagonal shape. The fort was built over the remains of a Roman monument, which may have been the barracks for Roman mariners, possibly for the Imperial fleet. The Cathedral of Civitavecchia is dedicated to San Francesco d'Assisi. It was built on the location of an ancient Franciscan church in 1610. The architecture of the Cathedral today is a mix of neoclassical and baroque and the present day edifice dates back to the 18th century. The interior of the cathedral has been elegantly decorated and is not to be missed. Best Price Guarantee - We always offer you our lowest available Tirrenia Ferries, Grimaldi Lines, Grandi Navi, Moby Lines or SNAV Ferries passenger and car ferries ticket price to and from Civitavecchia. There are no hidden extras or surprises such as added fuel surcharges or booking fees and we also we do not charge you anything extra for paying with a Visa Electron card. The price we quote for your selected Civitavecchia ferry ticket, onboard accommodation and vehicle type is all you will pay, and that's a promise! In the unlikely event you find the same all inclusive Civitavecchia ferry ticket cheaper in the brochure of any other tour operator we promise that we will do our best to beat that price or offer you the choice of requesting a refund. To book Civitavecchia car and passenger ferry tickets please click here. At FerryTO.ie you are able to obtain live Civitavecchia ferry ticket prices, check availability and book car and passenger ferry tickets to and from Civitavecchia at our lowest available ticket price. Ferryto.fr is part of the world's largest online ferry ticket distribution network providing the ability to book over 80 major European ferry operators including to Civitavecchia and to over 1,200 other ferry routes throughout the UK, France, Spain, Ireland, Holland, Eastern Europe, the Mediterranean, the Baltic and North Africa.